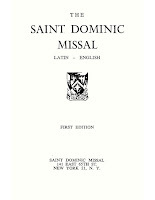 I have often been asked whether it would be possible to reprint the Saint Dominic Missal, originally printed in 1959 by the Eastern Dominican Province. 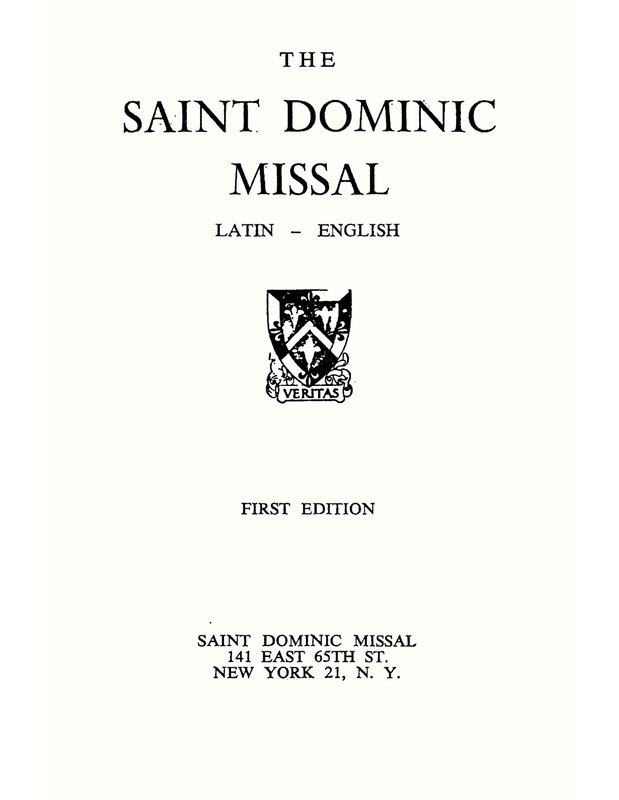 Some time ago, I mentioned that though the labors of Fr Sebastian White, O.P., a member of that province, had provided me with a very clean PDF of that hand missal. But since it was over 800 pages, and my books on demand publisher, Lulu.com, could not publish a book of that length, I did not, at that time, reprint it at Dominican Liturgy Publications. As the requests have become so common in these days when Dominican Rite Masses are celebrated weekly in the Western Dominican Province and on a regular basis in the Eastern Province, I have decided to reprint this book in two volumes. This may not be as convenient as a single volume, but each volume is completely self-contained and I do not think the inconvenience of the format will be very great. The two volumes are pocketbook-sized and paperback, the least expensive format possible. The first volume includes the entire Proper of the Seasons (Advent, Christmas, Epiphany time, Septugaesima, Lent, Easter, and the Time after Pentecost). It also includes the entire Ordinary of the Mass and devotional prayers. You may order it here. The second volume, which contains all the saints of the entire year, as well as all ritual and votive Masses, may be ordered here. Like the first volume, it also contains the entire Ordinary and devotional prayers for Mass. May God grant you all a joyful Easter Season!